Explanation: The dust that pervades our Solar System is not the dust that pervades our homes. Solar System dust comes from comets and asteroids, whereas house dust is most likely lint or dead cells. 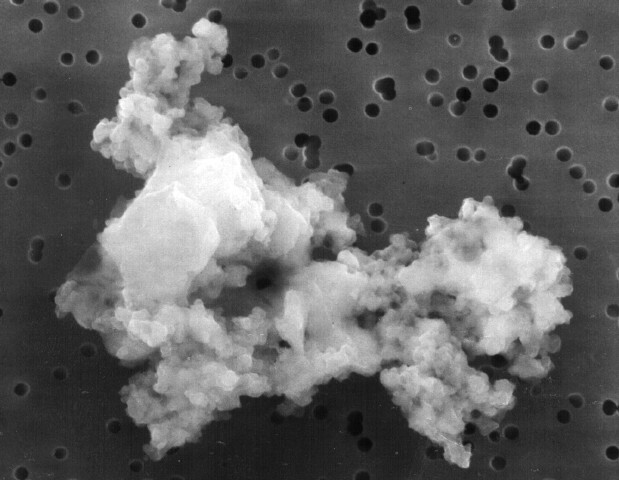 Pictured above is a piece of interplanetary dust caught by a high-flying U2-type aircraft. It likely originates in the early days of our Solar System, being stored and later ejected by a passing comet. The particle is composed of glass, carbon, and a conglomeration of silicate mineral grains. It measures only 10 microns across, a tenth the width of a typical human hair. NASA's STARDUST mission, launched in 1999, is scheduled to pass through the tail of Comet Wild 2 in 2004 and return many more interstellar dust samples to Earth in 2006.